In my work with ecoartspace over the past 12 years focusing on ecological artists and their projects, the term collaboration has been frequently evoked. The intention behind much of this work is to restore, remediate or transform damaged landscapes and also to educate the public about specific environmental problems or challenges. Artists taking on this imperative seek to inspire modification of human behaviors that have negatively impacted the earth’s ecological systems. Their work embodies what German artist Joseph Beuys coined as “social sculpture” over 50 years ago to illustrate art’s potential to shape society and the environment. 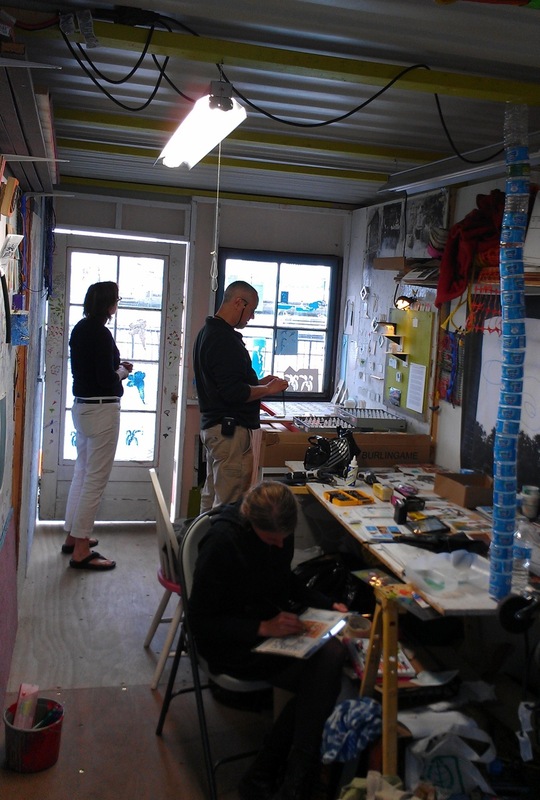 Ecological art demands forms of collaboration that are still rare in studio art practice in 2013. Collaboration in visual art (as opposed to design and architecture as well as performance-based art) is antithetical and contradictory to the position of the lone, iconoclastic artist of modernist/20th century ideals. Art schools continue to train artists to work independently as solo agents, emphasizing preparation for the entrenched market system of gallery and museum exhibitions and the art fair circuit to produce name brands. Ecological artists work from a different mindset, one which mirrors natural systems. Collaboration is not only a worthy goal or desire, but also a necessity in order to further community-based/public/infrastructure projects and to learn from needed specialists in other disciplines including science and engineering. Often the goal of these projects is to function (this word confronts all notions of art as useless) as components in ecological systems, operating outside of art spheres altogether. In order to succeed with their projects ecological artists must take into account the needs of specific communities with all constituents of these communities – human and non-human. Collaboration (and by implication participation) is a current art world buzzword. Used in terms of relational aesthetics, social practice art, and community based art projects, the word risks losing all meaning as just another trend for the art world to absorb. However collaboration is difficult and not for all artists – nor should it be. The collaborative process itself is intrinsic to the art making and the results of art interventions in ecological systems usually improve over time. Time itself is a key component. Meaningful dialogue and discussion towards a shared goal takes a long time. Ecological art projects can take several years of planning before implementation. Aside from the vision of the initial collaborative team and the work that went into achieving consensus, projects often require a lengthy permission process from bureaucratic government officials and agencies, business and private interests as well as community support, involvement and at best citizen participation. In recent years emerging artists have been addressing environmental issues and sustainability on a smaller, more immediate scale. This comes from a desire to create work in less time by doing more temporal public art works and bypassing the need for permits. These artists have developed ways of working that are performative and include direct engagement by the artist with the public. A recently completed curatorial project of mine titled TRANSported has been exemplary in demonstrating this collaborative participatory process. Habitat for Artists, an evolving collective of eighteen artists (they were included in my 2009 Schuylkill Arts Center project Down to Earth: Artists Create Edible Landscapes) created a self-sustaining artists studio and shared space for discussion and engagement held for one month by the Hudson River in Battery Park City, NY. 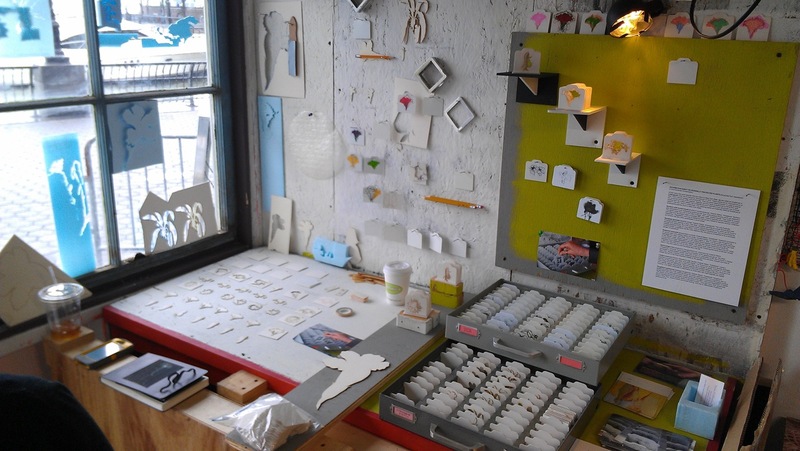 Changing on a daily basis, artists and partnering organizations worked both inside and outside of a shipping container – converted into art studio space. 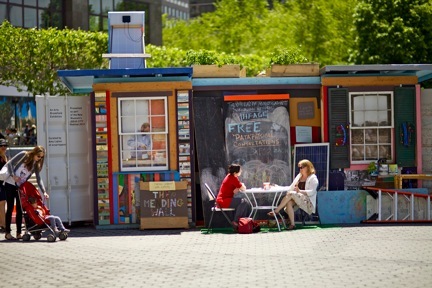 The container was powered by the use of solar roof panels and included a square foot roof garden. Exterior sides included a vertical green wall, rain barrel collection for water, attached hoop greenhouse for growing seedlings and a blackboard for drawing and changing communications. 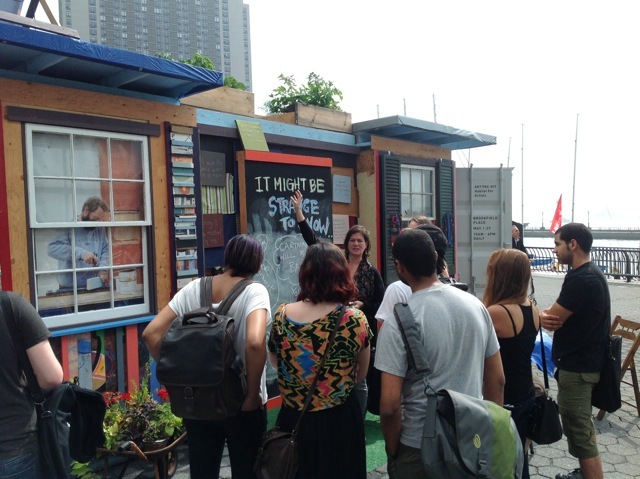 Over the course of 30 days the container became a hub for workshops, an ecological information and education center, after-school art space, artist in residence program – one huge interactive social sculpture. 1. The artists having a shared purpose over and beyond their individual expression. 2. A non-hierarchical decision making process with no specific leader. 3. Process over product- viewer engagement was the goal. 4. An interest in crossing disciplines and working with partners to learn. 5. A willingness to accept unpredictability and flexibility including limitations of weather and last minute changes in personnel. 6. Understanding that evolving daily changes to the space over time were a key component of the overall project. The Habitat for Artists participants each contributed a different component, working within their unique methods and styles for the benefit of a larger shared art/ecosystem and demonstrating that collaboration is a means and not an end. 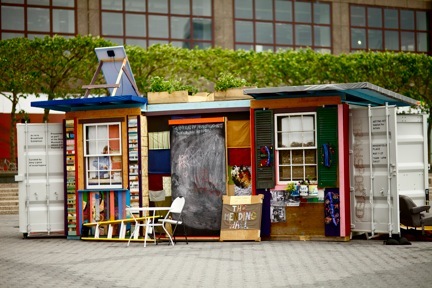 The collaborative approach to art-making that is inherent in ecological art calls into question some of the most basic premises of the contemporary art world and artists. However, both the pressing ecological issues and the need for broad social co-operation in global society necessitate the shift to a collaborative sensibility. 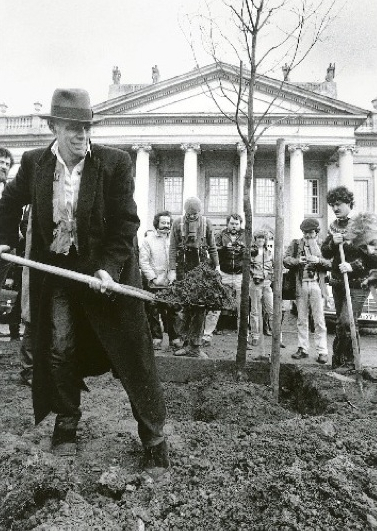 Following on Beuys’ idea of social sculpture, art can point society in meaningful directions. This entry was posted in Environmental Art and tagged art, art/ecosystem, Battery Park City, Beth E. Wilson, Brookfield Arts, Carla Goldberg, Carol Flaitz, Chris Albert, collaboration, Common Ground Farm, Down to Earth: Artists Create Edible Landscapes, ecoartspace, ecological art, Enviragen, environmental art, Faheem Haider, Habitat for Artists, Hope Windle, Hudson River, Hudson Valley Seed Library, Jessica Poser, joseph beuys, Laura Hersh, Lisa Breznak, Mario Mohan, Marion Wilson, Marnie Hillsley, Michael Asbill, Michael Natiello, Michelle Hersh, Molly Rausch, NY, Schuylkill Arts Center, schuylkill center, schuylkill center for environmental education, Sean Nixon, shared purpose, Simon Draper, social sculpture, Solar One, team, The New Museum's Ideas City Festival, Thomas DangVu. Organizations: Green Up, TRANSported, World Policy Institute. Bookmark the permalink.